John J. “Pat” Patterson, 89, of East Peoria, passed away at 8:07 pm Monday, April 15, 2019 at OSF St. Francis Medical Center in Peoria with his family by his side. He was born Aug. 7, 1929 in Clinton, MO to John Stanley and Rose Mae Myers Patterson. He married Mary Helen Reynolds in Pleasanton, KS in Oct. of 1946. He later married Etta L. Farris on March 25, 1977 in Peoria. She survives. Also surviving are his daughter, Pam Snyder; son, Mark Patterson; 4 step-children, Becky (Randy) Gauwitz, Karen (Karen Rieser) Regan, Ralph (Cathy) Farris, Kathleen (Shawn) Moore; and numerous grandchildren and great-grandchildren. He was preceded in death by his parents; 2 sons, Stan and John A. Patterson; and granddaughter, Kim Snyder. Pat was a US Marine Corps Veteran serving during the Korean War from 1948 to 1951. He was a truck driver all his working life and retired in 1985 with over 30 years as a Teamster from Local #627 while driving for Bosch Trucking Co. 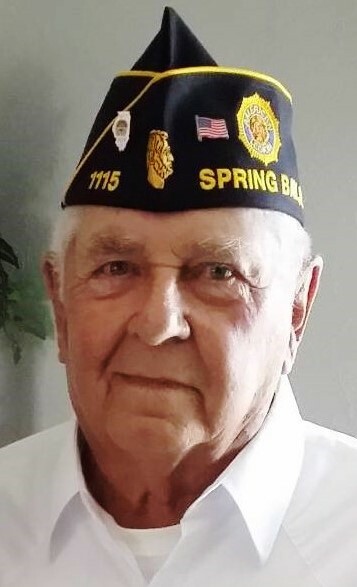 He was a member of the Spring Bay American Legion Post 1115, Teamsters Local 627 Retirees Club, National Rifle Association, American Fishing Club, and Farm Heritage Tractor Club. Spending time with his family was one of the most important things to him and he will be dearly missed. Visitation will be from 5 to 7 pm Thursday, April 18, 2019 at Deiters Funeral Home and Crematory in Washington. A funeral service with military honors will be held at 10am Friday at the funeral home. Pastor Curt Rowden will officiate. Cremation rites will be accorded following the service. There's still time to send flowers to the Funeral Service at the Deiters Funeral Home & Crematory at 10:00 AM on April 19, 2019.